It all comes down to one choice- Comfort Zone or Productivity? In the quest for increasing our productivity, we do n number of things. From buying self-help books to reading article after article on the routines that successful people follow. Our minds get filled up with so many productive hacks and yet another day seems to have gone down the drain. Five simple words - We simply do not ACT! Not knowing what our next moment will be like makes us stressed. Would I be sitting in the same, comfortable chair writing an article? Or would I change my routine and follow that productive hack that I know will help me? The fear of uncertainty drives us to keep doing the same things over and over again. It pushes us to be stuck in our comfort zones. This is not just limited to the work we do, it spills over in every facet of our lives. We go to the same restaurant, we order the same kind of coffee, we take the same route to work every day and we remain stuck in the same position at the same job for so many years. Studies show that stepping out of our comfort zone leads to increased productivity, creativity and the ability to deal with new and unexpected changes. From our childhood, we have been told that we should be consistent. Wake up at 7, have dinner at 8, go to bed at 10 and on and on it goes. Don’t get me wrong here. Having a routine you can follow is good, sometimes even necessary. But to what extent? Consistency often drives us into autopilot mode. Our brain is designed to preserve energy. So, when we’re in a calm and comfortable environment, we neurologically shut our effort off to save energy. Take for example, everyone at your workplace still has face-to-face interactions to know how much of the work is completed instead of just having a work management tool that can track everyone’s progress and help lessen the stress of remembering stuff. 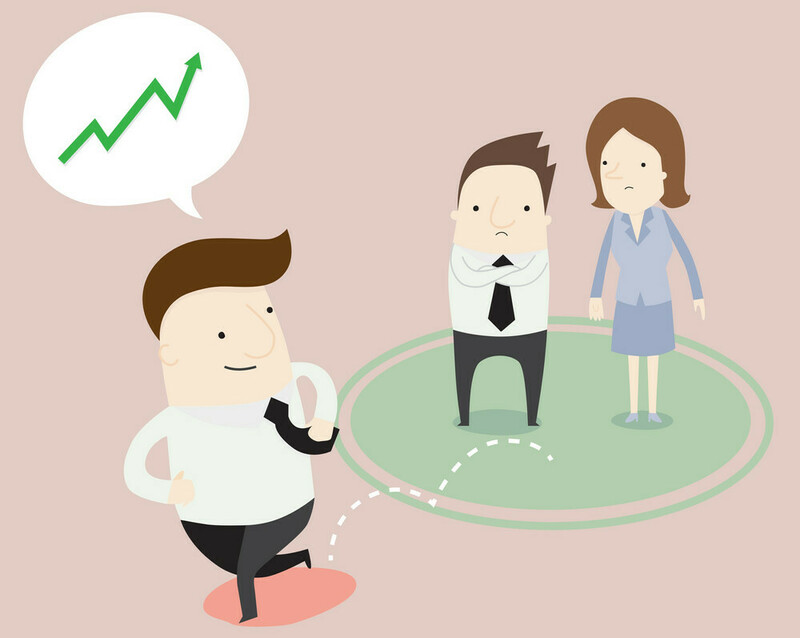 Read more: Why businesses spend 37$ billion per year on meetings and still find them unproductive? Consistency sometimes fools us into doing the same thing over and over again even when there is a better and more efficient way lurking out there. The only thing we need to do is get out of that ‘But, we have always done it this way’ thinking. In 1908, Robert M. Yerkes and John D. Dodson conducted a psychology study which found that a state of relative comfort creates a steady level of performance. 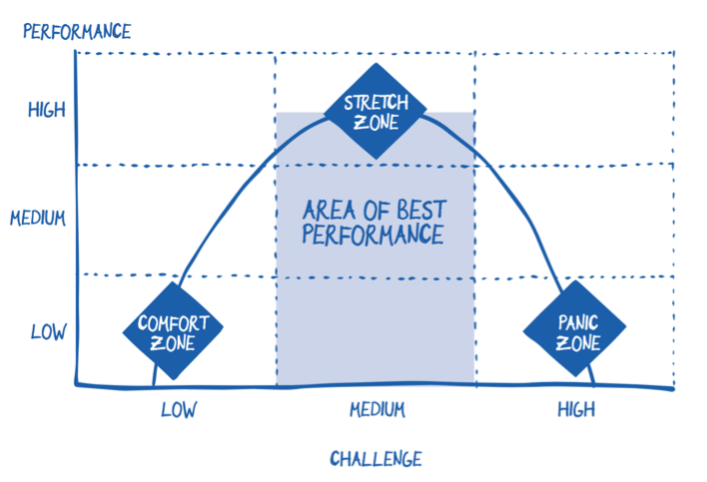 To break this steadiness, we need to move to a space called Optimal Anxiety or the stretch zone, which falls somewhere between our comfort zone and panic zone. Our brain learns best when stress levels are a little higher than normal. It motivates us to do enough without debilitating our performance. This shouldn’t come as a surprise. After all, we have all had impending deadlines push us to do some amazing work. While getting out of our comfort zone may feel like climbing a mountain that doesn’t seem to end, we all have unknowingly gotten out of it more times than we think. Like the time when you first started driving a car, giving your first presentation in front of a packed conference room, your first day at trying a sport you never thought you would end up loving so much. Did you not go to that event because you didn’t like the activities or you were afraid to socialize? Did you not apply for that university because the fees were too high or you were afraid you wouldn’t get in? Look at yourself and ask why you are doing the things you are doing. Is it because you like them or because they are easy? Be honest with yourself and you’ll find at least 3-4 aspects of your life where you’re stuck in your comfort zones. Uncertainty is what creates fear. To break through your comfort zone, you need to first educate yourself. 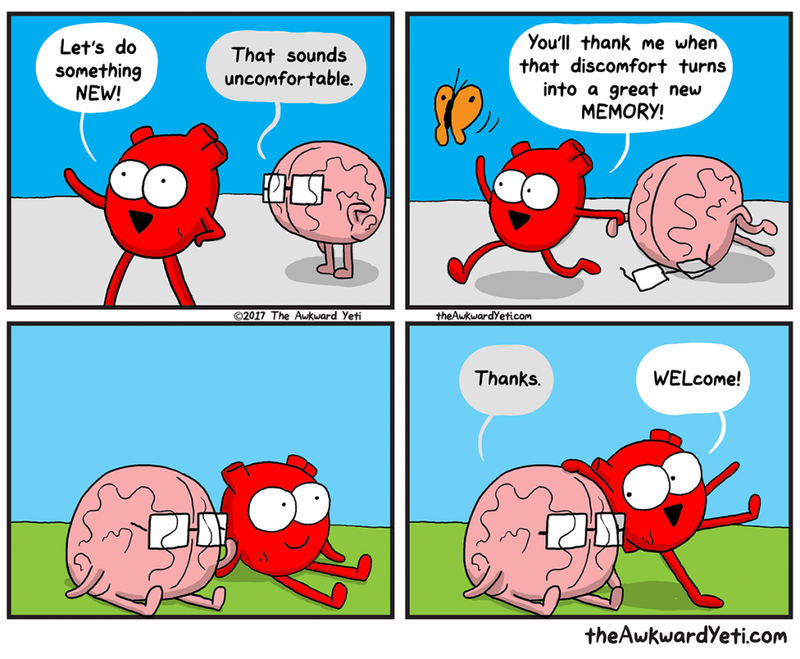 If moving out of your comfort zone is something as big as moving in to another field, anxiety will step in. Instead of just sitting and worrying about it, get as much information as you can. Read articles, watch videos, read books and even talk with people working in that field. The more you know about something, the less scared you will feel. As the saying in Bhagvad Gita goes, ‘Surrender the fruits of your actions’. When we work constantly thinking about the outcome, we can never give our best. It’s because we are overly obsessed and worried about the results. Find contentment and learning in the journey you are on, regardless of the outcome. For example, say you are a sales person. You are amazing with negotiations and meeting clients but when it comes to cold calling, you take a step back. Set a goal to make 10 calls per day. If someone is rude to you or doesn’t answer properly, instead of spending your time thinking about it, move on to making the next call. If you aren’t sure about where to start, start doing whatever comes across your way. You could join a cooking class or you could apply for that course completely unrelated to your field. You never know what piece of information could come in help at what time. Take Elon Musk for example. He used to devour books, not only related to programming but of many other fields. His curiosity in such a wide range of topics helped him set up companies in varied industries like Space, Automobile, Solar and the latest coming up in transportation. Once you gain some confidence, think about that one goal you have. It could be writing a book. Start by setting small goals like writing a paragraph every day. If you want to get fit, start by walking 10 minutes every day. If after a sabbatical, you have decided to pursue studies again, dedicate 1 hour every day for preparing for that entrance test. Looking at a big dream may be intimidating and far out of your comfort zone but breaking it down into tiny steps will significantly decrease that overwhelming feeling. If you’re someone who interacts with the same circle of people every day or every weekend, it’s time to step out and meet new people. This will not only open you up to new thinking and new experiences but will also help increase your confidence. When you start being comfortable with that, take it a step further. Talk to people you disagree with. It will be a great learning booster in terms of gaining new perspectives and is also known to increase empathy. A study conducted by psychology professor Dr. Gail Matthews from Dominican University found that people who wrote down their goals, shared this information with a friend and sent them weekly updates were on an average 33% more successful in achieving them than those who merely formulated them. When you are accountable to someone, it becomes all the more harder to quit. Having an accountability partner helps you in taking up challenges, celebrating milestones, making sure that your goals remain a priority and most importantly getting rid of that I-have-to-do-it-all-alone feeling. Once you start something new, you may think that you have moved into the learning zone. But, regularly practicing a talent or ability won’t necessarily increase your productivity. Say, for example if you want to be a story writer but you stick only to writing about fairies and demons, you won’t make it that far no matter how much you keep on writing. When something seems easy, it’s a sign that you have settled down in your comfort zone. Challenge yourself to pick up a new thing like writing about crime or adventure and see where it takes you. As Wayne Gretzky says, ‘You’ll always miss 100 percent of the shots you don’t take.’ Let’s break out of our comfort zone, step by step and see where the journey takes us.